Mahal - Who Can Volunteer for Service in the Israel Defense Forces (IDF)? Who Can Volunteer for the IDF? • IDF service for min. 14 months (or min. 18 months including army ulpan, if necessary). • Studying at an Israeli academic institution for the standard time required to get a bachelor's degree (including mandatory preparatory course, if any). The standard periods vary for different fields of study. You are exempted in your standard period from IDF service (mandatory or reserve). • Leaving Israel: you are not liable for any additional IDF service (mandatory or reserve), even if you return from time to time as a tourist. • Staying in Israel as a Toshav Hozer (or returning after less than 24 months as a Toshav Hozer): basically, you have to complete the IDF service time which was mandatory for your age at the time of your first arrival in Israel. The extra service time varies due to individual factors; as you can calculate for yourself, this may also be zero (for example if you are too old). In any case, you will be assigned to a Reserve Service unit; the IDF does not, however, always call up all of their reservists every year, and a variety of exemptions are available. • IDF service for the time which was mandatory for your age at the time of your first arrival in Israel. The extra service time varies due to individual factors; as you can calculate for yourself, this may also be zero (for example if you are too old). In any case, you may be assigned to a Reserve Service unit; the IDF does not, however, always call up all of their reservists every year, and a variety of exemptions are available. 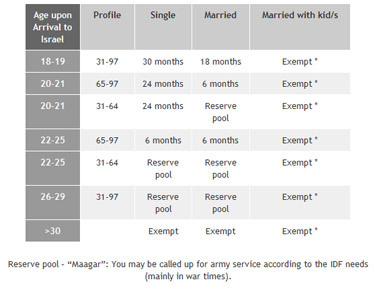 - if you return after less than 24 months as a Toshav Hozer: basically, you are liable for service in the IDF for the time which was mandatory for your age at the time of your first arrival in Israel. The extra service time varies due to individual factors; as you can calculate for yourself, this may also be zero (for example if you are too old). In any case, you will be assigned to a Reserve Service unit; the IDF does not, however, always call up all of their reservists every year, and a variety of exemptions are available. IDF units and jobs when eligible for IDF enlistment - here. The assignment to a specific IDF unit or job is based on a few factors such as the army’s needs, your medical profile as determined by IDF tests during the enlistment procedures (in Israel), your min. service time, and your preferences. The final decision about the enlistment and assignment to a specific IDF unit and job relies exclusively with the IDF. The qualification of non-Israelis expires, if not enlisted before the 24th birthday (men) | 21th (women) | 36th (physicians). Depending on age and marital status, the regular IDF service (Shlav Bet) for Israeli citizens might be shorter than other programs such as Mahal, Mahal Nahal Haredi, Mahal Hesder. The informations on our pages About the Service and Volunteering Step-by-Step do not refer to Israeli overseas reasidents but only to (non-Israeli) volunteers eligible for the Mahal, Mahal Nahal Haredi and Mahal Hesder programs.